MANILA, Philippines – The December 2017 Criminologist Licensure Exam (CLE) results or the Criminology board exams' full list of passers, top 10 examinees, top performing schools, performance summary of schools, among other related announcements are available at this website as PRC releases the results online twenty one (21) working days after the last day of board examination. As announced, 13,025 out of 36,516 examinees passed the exams. According to the Commission’s Resolution No. 2016-1019 series of 2016 entitled “Schedule of Licensure Examination for Year 2017”, the target release date of December 2017 Criminology board exam result will be in twenty six (26) working days after the last day of board examinations or by January 16, 2018 (Tuesday). However, results may also be released earlier or later without prior notice. On the same exams conducted by PRC on June 2017, results were out after twelve (12) working days. On October 2016, results were released after twenty-five (25) working days. Eleven (11) working during April 2016 days while twenty-four (24) working days during October 2015. The schedule of online appointment for issuance of Professional ID and Certificate of Registration will start from January 23 to February 9, 2018. On the most recent CLE held on June 2017, 5,202 out of 20,819 examinees successfully passed. Gander Suello Quillip from University of Mindanao - Digos College topped the exams having 88.40% rating followed by Matthew Tobias Solomon from ICCT Colleges Foundation Inc. garnering 88.35%. University of the Cordilleras (UC) got the top spot in the top performing schools' list having 93 out of 97 examinees passed or 95.88% overall passing rate followed by Lipa City Colleges having 62 out of its 68 examinees passed or 91.18%. On the same exams conducted October 2016, 10,901 out of 34,768 examinees passed. UC ranked first in the top performing schools' list having 59 out of 62 examinees passed or 95.16% overall passing rate followed by King's College of the Philippines Inc. having 62 out of 70 examinees passed or 88.57%. Christine Joy Almano Capalar from Sultan Kudarat State University - Tacurong ranked first in the exams garnering 91.55% rating followed by Genzy Pastolero Llorito also from the same university having 90.85%. On April 2016 CLE, 3,928 out of 16,435 passed the exams. UC ranked first in the top performing school having 105 out of 107 passed or an equivalent 98.13% overall passing rate followed by Lipa City Colleges with 57 out of 62 examinees passed or 91.94% overall rating. Meanwhile, Jared John Francisco Adolfo from University of Mindanao - Tagum ranked first in the said exams garnering 88.15% rating. He was followed by Harold Tubongbanua Sarita from De La Salle University - Dasmariñas having 88.00% and Jonathan Apolog Langbayan from Mountain Province State Polytechnic College Bontoc having 87.90% rating. 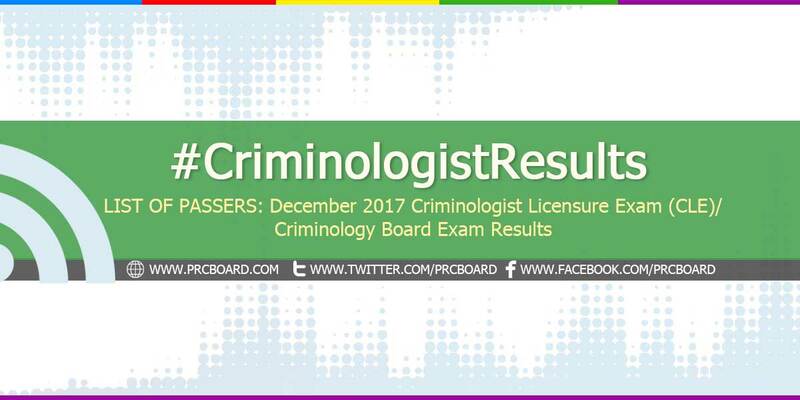 To receive up-to-date news on full results of December 2017 Criminology CLE board exams, we advise our visitors to bookmark this page, visit PRC official website or follow us at our social media pages via Facebook and Twitter.